February: and like the author of our introduction to the “secret poem” below, I find myself these last many years living near water: Tampa Bay and the Gulf of Mexico. Unfortunately, I suppose, unlike for her, their call and effect have diminished, if they ever exerted their charms upon me at all – like all views they long ago have succumbed to the quotidian. Or perhaps it is merely that my strongest affinities have always lain elsewhere, landlocked, specific to the Louisville neighborhood that appears so regularly in my poems, its craggy ditches and dandelioned backyards. For this is where I found the serenity of which Nancy Mitchell speaks, where finally the “fist of fear” unclenched. No doubt it was familiarity, its confinement and boundaries, that comforted me; already, innately, I was a claustrophile, not a claustrophobe. Still, though our antecedents differed they twined, mine and Nancy’s, in our eventual discoveries of poetry: that most echoic of the arts, whispering back to us the “emotional trajectories” from which our most powerful memories are sourced. Read on, then, and find again in Ms. Mitchell’s beautiful investigation of Louise Bogan’s poem “Night” perhaps your own “connection to the natural world” whatever form that might assume. Born under a water sign, I swam before I walked, and for most of my life, by chance or design, I’ve lived on or within walking distance to a large body of water. If I wish or pray it is to water I whisper. For decades I lived on a small barrier island between an estuary and the sea. Over the unspooling years of what is now a long life, it was the sea in which I frolicked, swam and surfed by day, but at night it was to the estuaries to which I turned, particularly in times of emotional turmoil. Maybe it was the lithium gas reportedly released by the salt marsh, or the breeze whispering in the reeds or the tides rhythmic lapping at the shoreline, but what was contracted in me would gradually expand and the fist of fear would release. Years and years ago, during a low-residency MFA semester, I found myself restless and anxious; landlocked and hemmed in by an endless range of smoky mountains, I ached for my vista of horizon and water. One afternoon, while moping around the empty dorm lounge, I found a copy of Blue Estuaries, Poems 1923-1968 by Louise Bogan lying on a table, face down on the poem “Night.” As I read it, I felt the tightness in my chest release and my breathing slow down. Amazed, I read it over and over trying to figure out just how this small poem had affected a change in my body so like the emotional trajectory of my estuarial nights. In this compulsive investigation, my hazy understanding of prosody, especially the use of sound, was clarified. With the assonance of the long vowel “o” in “cold and remote” Bogan slows that first short line The cold remote islands and establishes a lonely, lovely, melancholy tone as well as the emotional and literal perspective from which the poem will move. This pace is maintained by the long “e” throughout the following lines—estuaries, drinks and the anaphoric breathes. The sibilant s whispers throughout the entire poem, a deceptively wispy ribbon tying the stanzas together. In the subsequent stanza Bogan has cleverly secured our complicity with the we in weed and our collective eye/I sweeps from the “shell and weed” upward to the infinite vista of the sky, where …the clear nights of stars/Swing their lights westward.Although our eyes are swept to the heavens, Bogan firmly plants our feet on terra firma with the ending mute “d” of weed and westward. The third stanza promises a “forever” in the seemingly mutable, yet immutable cycles implicit in the mute ” t” of rock, night, firmament, subtly modified by the ending sibilance s.
In the final stanza, the omniscient, oracular voice exhorts us—with the authority of the final unequivocal mute t in heart— to remember That more things move/Than blood in the heart as a hedge against the existential and egotistical loneliness of ournarrowing dark hours, inevitable when forget our connection to the natural world. Louise Bogan was appointed the fourth Poet Laureate to the Library of Congress in 1945. As poetry editor of The New Yorker magazine for nearly 40 years, she played a major role in shaping mainstream poetic sensibilities of the mid-20th Century. Nancy Mitchell is a 2012 Pushcart Prize winner and the author of The Near Surround (Four Way Books, 2002) and Grief Hut (Cervena Barva Press, 2009). Her poems have appeared in Agni, Columbia College Literary Review, Green Mountains Review, Poetry Daily, Tar River Review, Thrush, Tulane Review, and Washington Square Review among others. She is the co-editor of and chief contributor to Plume Interviews I (2017). 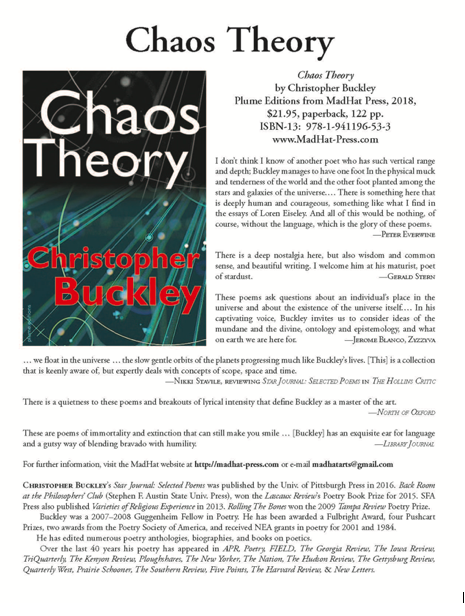 Mitchell teaches at Salisbury University in Maryland and serves as the Associate Editor of Special Features for Plume. Penultimately: As noted, for the launch of Plume Poetry 6, we will host readings on 7, 8 and 9 March at AWP, early evening, probably 7:00 – 9:00. We have a beautiful venue – the Aloft Hotel – with as promised a bar/restaurant in the same building, to which we can repair and chat away after the programs. I very much look forward to seeing as many of you there as possible. More information on the Plume Booth # and other assorted matters next month. As dusk approaches, the vending machines shine around the city and the roadside. This scenery is unique to Japan where vending machines are ordinarily placed on the street. I especially like the lights of vending machines shining on snow. Sometimes I feel like being drawn into this light. The vending machine looks like a living thing and catches my heart. I think that vending machines are staring at everywhere in Japan, just as I feel as being monitored by vending machines. With the approach of dusk, vending machines begin to emit light on the streets. This scenery is in particular in Japan, where vending machines are casually placed on the road. What I love especially is the light of vending machines on snowy nights. Sometimes I feel I am drawing into that light. Those vending machines look like they are living creatures and keep me fascinated. Is it only me who feels like being monitored by them? They can be found in metropolitan areas, of course, but also in the furthest corners of the mountainous areas and the end of a promontory. I had wondered in such cases, “Who uses this machine?” The vending machines do not appear in any special or extraordinary place. Rather, they appear in ordinary places: a non-descriptive end-of-the road or in front of someone’s house, for instance. Today, it won’t be an overstatement to say that the vending machine has become the most familiar sight that symbolises Japan, but I suspect only a few people are aware of the fact that the sheer spread of vending machine is unique to this country. Yet, when the Great Tohoku Earthquake hit in 2011, and the events surrounding the nuclear reactors led to a nation-wide power-saving campaign, one of the first items listed as wasteful products was the vending machine. Sure, humans can live without vending machines. There is even a sense of skepticism in becoming too comfortable with the convenience it affords. But in Iwate and Miyagi prefectures ― areas that suffered severely both from the earthquake and its aftermaths ―vending machines were the first to be set up after the cleaning and removal of buildings and debris. I hear that these were set up to supply water to the workers and affected citizens engaged in recovery efforts. In Japan, vending machines now occupy an important part of the infrastructure. They also prove the safety of our society in that these machines can be placed anywhere. I hear there are twice as many vending machines in the U.S, but all of them are located indoors. In Hokkaido where I live, winters are harsh and snows are deep, and every day can become rather inconvenient, but even then I can get warm drinks from the vending machines. When I hold a warm bottle that I buy from the vending machine, my feelings relax. It might be a peculiar mentality of the Japanese, but for me, a vending machine has over the years become an object that reminds me of the story “Hat Jizō”, a story that has been passed down from generation to generation. 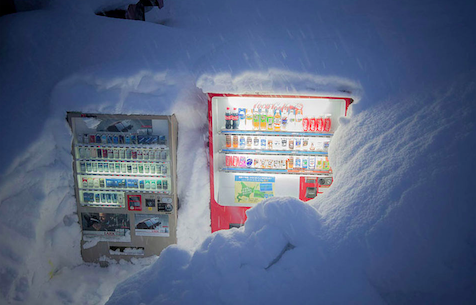 When I lived in Wakkanai-city, the northern-most city in Japan, I remember being caught in a snowstorm and I had to use lights coming from a vending machine to ascertain my own location. Since then, I slowly began to pay attention to vending machines, and soon after I was directing my gaze at them and thoughts to them and the lights they emit with attention and affection. On one snowy night, I was attracted to the form of snow lit up by the vending machine, and since then, on every night that brings fresh snow, I go out before the snow-plows come to photograph the beautiful sights. I probably looked like a strange suspicious man to others. Naturally, it is difficult to photograph under such weather conditions, but I could not be happier than taking photographs of the mysterious encounter of form and light orchestrated by vending machine and snow. Copyright © |PLUMEPOETRY_2016| All rights reserved.